"Memorabilia" redirects here. For other uses, see Memorabilia (disambiguation). For other uses, see Souvenir (disambiguation). A souvenir (from French, for a remembrance or memory), memento, keepsake, or token of remembrance is an object a person acquires for the memories the owner associates with it. A souvenir can be any object that can be collected or purchased and transported home by the traveler as a memento of a visit. While there is no set minimum or maximum cost that one is required to adhere to when purchasing a souvenir, etiquette would suggest to keep it within a monetary amount that the receiver would not feel uncomfortable with when presented the souvenir. The object itself may have intrinsic value, or be a symbol of experience. Without the owner's input, the symbolic meaning is invisible and cannot be articulated. The tourism industry designates tourism souvenirs as commemorative merchandise associated with a location, often including geographic information and usually produced in a manner that promotes souvenir collecting. 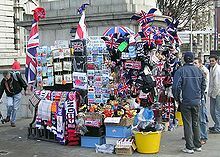 Throughout the world, the souvenir trade is an important part of the tourism industry serving a dual role, first to help improve the local economy, and second to allow visitors to take with them a memento of their visit, ultimately to encourage an opportunity for a return visit, or to promote the locale to other tourists as a form of word-of-mouth marketing. Perhaps the most collected souvenirs by tourists are photographs as a medium to document specific events and places for future reference. Souvenirs as objects include mass-produced merchandise such as clothing: T-shirts and hats; collectables: postcards, refrigerator magnets, miniature figures; household items: mugs, bowls, plates, ashtrays, egg timers, spoons, fudge, notepads, plus many others. Souvenirs also include non-mass-produced items like folk art, local artisan handicrafts, objects that represent the traditions and culture of the area, non-commercial, natural objects like sand from a beach, and anything else that a person attaches nostalgic value to and collects among his personal belongings. A more grisly form of souvenir in the First World War was displayed by a Pathan soldier to an English Territorial. After carefully studying the Tommy's acquisitions (a fragment of shell, a spike and badge from a German helmet), he produced a cord with the ears of enemy soldiers he claimed to have killed. He was keeping them to take back to India for his wife. Similar to souvenirs, memorabilia (Latin for memorable (things), plural of memorābile) are objects treasured for their memories or historical interest; however, unlike souvenirs, memorabilia can be valued for a connection to an event or a particular professional field, company or brand. Examples include sporting events, historical events, culture, and entertainment. Such items include: clothing; game equipment; publicity photographs and posters; magic memorabilia; other entertainment-related merchandise & memorabilia; movie memorabilia; airline and other transportation-related memorabilia; and pins, among others. Often memorabilia items are kept in protective covers or display cases to safeguard and preserve their condition. In Japan, souvenirs are known as omiyage (お土産), and are frequently selected from meibutsu, or products associated with a particular region. Bringing back omiyage from trips to co-workers and families is a social obligation, and can be considered a form of apology for the traveller's absence. Omiyage sales are big business at Japanese tourist sites. Unlike souvenirs, however, omiyage are frequently special food products, packaged into several small portions to be easily distributed to all the members of a family or a workplace. In the Philippines a similar tradition of bringing souvenirs as a gift to family members, friends, and coworkers is called pasalubong. ^ a b "Online Etymology Dictionary". etymonline.com. ^ a b "Museum of the personal: the souvenir and nostalgia". byte-time.net. Archived from the original on 2011-07-23. ^ Niu, Jiurong (February 2010). The Design and Development of Tourist Souvenirs in Henan (PDF). International Symposium on Tourism Resources and Management. pp. 329–332. Retrieved 17 April 2016. ^ "About me". Souvenir Finder. ^ "Aviation and Airline Memorabilia". Collectors Weekly. ^ "Omiyage Gift Purchasing By Japanese Travelers in the U.S." acrwebsite.org. Look up souvenir in Wiktionary, the free dictionary.